Type of wine: Richly flavored, medium-bodied white. 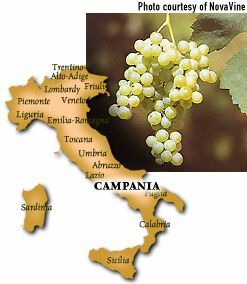 Origin: FIANO DI AVELLINO, one of Southern Italy's most famous white wines, is produced in the Campania region, from vines grown on the volcanic hillsides of Avellino, east of Naples. Description: Light, straw-yellow color with appealing aromas and flavors of ripe pears, honey and toasted hazelnuts. Aging: At its best after a year or two in the bottle, Fiano will age up to five. Best location: Bright sunlight, heat, and volcanic soils are this vine's preference. FastFoodFacts: Fiano's racy acidity makes it perfect for foods with high fat content: triple creme cheeses, salami, sausages, etc. Can also be used to add acidity to a wine-friendly salad dressing.